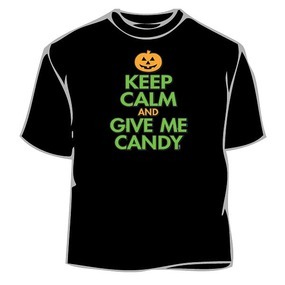 keep calm and give me candy. As one of our cool and comfortable tshirts it makes a great gift for someone who likes halloween. This design is printed on a 100% cotton premium quality blank shirt. Our Keep Calm Give Me Candy T-Shirt is incredibly comfortable and it is made to last. Our Novelty Halloween T-Shirts are made in the colors and sizes to meet your taste. If you have any questions or suggestions regarding our Keep Calm Give Me Candy T-Shirt or any of our other we are an e-mail away from servicing your needs but don't forget to include the product name.